No, it wasn’t a bad dream. Sybil really did die on last week’s episode. I have to admit, I’m still not over it. As this week’s installment begins, Lord Grantham bids farewell to the last of the mourners as Carson, ever stoic, looks on. Inside the family forms a tableau of grief in the drawing room. “My wife is dead. I’m passed help -- but thank you,” replies Tom. I know I’ve said it before, but I am so impressed with Allen Leech’s performance this season. Last week, he was truly outstanding and in this episode his subtly shaded performance is also excellent. Lord Grantham invites the Dowager Countess and Isobel to stay for dinner, but his mother declines her voice quivering as she tells him, “I don’t think so, grief makes one so terribly tired.” Is there anyone better than Maggie Smith? I can’t quite muster much sympathy for Lord Grantham at this point even though he, too, is grieving for Sybil which I find a bit surprising since he has been, up until this season, one of my favorite characters on the show. Between his arrogance, snobbery and shocking bigotry (which rears its ugly head again on this episode), he has become increasingly out of touch with the changing world and his intransigence (despite what Violet told him about that last season) has gone from annoying to downright destructive. “Do you think I miss her any less than you?” he asks stepping right into it. “I should think you miss her more since you blocked the last chance we had to prevent her death,” she says staring straight at him. Lord G is getting it from all sides. The next morning at breakfast with his two sons-in-law and Lady Edith (“Spinsters get up for breakfast”), Tom says he’s going to be leaving Downton as soon as he can find a job. Matthew and Edith are horrified by the prospect but Robert, eager to put the whole ‘Branson’ episode behind him says, “Tom’s right. He’s got to start making a life for himself.” Tom, feeling more like a fish out of water than ever, looks slightly hurt but not surprised. Edith attempts to steer the conversation in a different direction suggesting that now that the funeral is over, they should begin planning the christening. She offers to go see Mr. Travis to “fix the date” (I’m going to start using all these clever phrases – they’re so pithy!). Do you know what you’d like her to be called, she asks? “Of course,” says Matthew clearly touched. Then Tom drops the real bombshell. The baby will be baptized Catholic. “My daughter is Irish and she’ll be Catholic like her father.” The news is enough to send Lord G storming out of the dining room. There hasn’t been a Catholic Crawley since the Reformation!” he sputters. “She isn’t a Crawley, she’s a Branson,” says Mary. “The only chance that child has of achieving anything in life is because of the blood of her mother.” Lovely sentiment, Lord G.
“Well I don’t agree,” says Mary, who I really loved in this episode. Father and daughter then spar over Tom’s decision to name the baby after her mother. “I think it’s ghoulish!” says Robert who is becoming increasingly agitated because no one is agreeing with him on anything. It’s a good thing he’s got Isis. “Well, I don’t,” says Mary who then calmly goes back to read her book. Robert tells her they are barely speaking and that Cora is not only grieving for her daughter but for her marriage as well. Isobel invites the Grantham women to ‘a lunch party’ (this allows for some charming scenes between Ethel, Downton’s own Hester Prynne, and Mrs. Patmore as the soft-hearted cook defies Carson’s orders to the staff to avoid any dealings with the woman of ill-repute while she helps the novice whip up a suitable menu -- “Anyone with use of their limbs can make a salmon mousse!”). Earlier in the episode Ethel asks Isobel about the funeral and when Isobel remarks how hard it is when “you bury someone young,” Ethel replies, “When you lose a child there’s nothing worse under the sun” reminding us that she is also suffering an unimaginable loss. Ethel’s storyline has also been a revelation. Last season, when I groused about Julian Fellowes giving this storyline too much play, I should have known it would wind up adding someone unexpected dimension to the overall story. Ethel’s downright noble decision to give up her son so that he would have a better life and the scenes in which that played out were just as heartbreaking as Sybil’s deathbed horror. Determined to find someone within fifty miles that will side with him on anything (and outwardly thwart Tom’s plan to christen his daughter Catholic), Robert invites the reverend Mr. Travis for dinner. “Isn’t there something un-English about the Roman Catholic church?” he asks the table. “Since I am an Irishman that is unlikely to bother me,” says Tom pointedly. Mr. Travis, another highly irritating character to my Irish Catholic sensibilities, derides the church’s use of incense and ceremony as paganism which angers Tom and has Mary, Edith and Matthew coming to Tom’s defense. “I simply do not think it would help the baby to be baptized into a different tribe than this one,” says Robert keeping his reputation in tact as the most clueless man at Downton. “She will be baptized into my tribe,” replies Tom. “You’re always by the unconventional,” volleys Cora. “But in a family like this one …” Robert reasons. “Not everyone chooses their religion to satisfy DeBretts,” says his wife delivering a zinger worth of the Dowager. Fabulous. That night, Mary and Matthew engage in some pillow talk about Sybil’s death (“You’d think we’d be used to young death after four years of war,’ he says) and his plans to try to get Robert to modernize Downton (“We have to work if we want to keep it”). We must not take anything for granted, says Mary, “Who knows what’s coming?” Uh-oh. I felt the chill of foreshadowing when she uttered those words while looking into her husband’s eyes. “But there was a chance,” says Clarkson growing slightly uncomfortable. So you want me to lie? He asks. The answer to that question would be yes and as soon as possible. Meanwhile, Matthew and Tom’s bromance continues apace as walk they grounds of some of rundown farm on the estate while trading friendly barbs about how little they know about farming. It turns out (oh so conveniently) that Tom’s uncle was a tenant sheep farm in Ireland so he knows a thing or two about working the land. Later than day Robert has lunch with his two sons-in-law and Matthew tries pressing his case for meeting with Mr. Jarvis, the manager of the estate, about his ideas to help make Downton profitable. Must we talk about this now? Robert says. It’s boring for Tom, who is sitting silently watching this unfold. Matthew, who is proving to be a bigger nuisance for Robert than Tom, takes offense at this and reminds him that Tom is the father of his only grandchild. If they needed any evidence that Robert still thinks of Tom as a servant from below stairs they got it. Perhaps they want the maids to weigh in on the future of Downton while we’re at it says Robert growing angrier by the minute. When Matthew tells his father-in-law they must act now if they want to stop any further damage caused by bad management, Robert explodes. “Bad management!” Tom and Matthew are rescued from any further outbursts when Carson asks for a word with his lordship. Just asking, but I bet Robert is rethinking that whole we-must-get-rid-of-Strallan campaign. If he’d let the old chap join the family he might have been able to wage more of a well matched fight against the wave of change Matthew and Tom have sent through his life. It’s the day of Isobel’s lunch and she is upset with Ethel for disobeying her request to keep it simple with some ham and a simple salad (“I smell cooking!”). Don’t worry Ethel reassures her, I’ve had help. The ladies are enjoying their delicious meal when Robert bursts in and announces, “We’re going.” It seems Carson, appalled that the Crawley women are being waited on by a former prostitute at Isobel’s house, has spilled the beans about it to Robert. “Do you know who has prepared this lunch for you?” he blasts. That night Mary tries to get her father to join the family in the drawing room. No, he says, his presence will only set Cora’s “teeth on edge.” She’ll “come through it,” says Mary. “Which brings me to your performance today. Did that help?” Mary wisely surmises that Robert was not angry at Isobel or Ethel but rather raging at the world because “things aren’t going your way – not anymore.” Robert asks Mary if she is aware of her husband’s plans to throw out all of Robert’s ideas on running Downton and replace them with new ones. “A fool and his money are soon parted and I have been parted from mine so I suppose I am a fool.” Since there’s no argument there, Mary ignores her father’s comment and tells him he “won’t win” over the christening. “Not if you’re against me,” pouts Robert. “I’m never against you, but you’ve lost on this one,” says Mary. Still disbelieving over Sybil’s request that the child be Catholic he asks Mary about her wishes. Sybil wanted Tom to be happy, Mary says, she loved him very much and we all need to remember that. Finally, a glimmer of the loving, soft-hearted Robert that told Mary to go to the “middle west and bring us back a cowboy” in season two returns when he tells her he keeps forgetting his youngest daughter is gone when he sees something in the paper that he thinks would make Sybil laugh or spots her favorite roses in bloom. Mary begs her father to tell her mother what he’s just said to her. She doesn’t want to hear it from me he says. Okay, so Robert’s isn’t the worst guy in the world after all. Mary and Matthew visit Tom and the baby (how gorgeous was that child!?) where, ironically enough, he tells them she’s “blooming.” Sob. When they arrive at the house they find Dr. Clarkson waiting for them. When Robert tries to apologize to him, the doctor stops him from continuing. He tells them that he feels he might have misled them about what he could have done Sybil. With the Dowager looking on, Clarkson says that there was only a “tiny” chance on “that awful night” the outcome would have been different had he been allowed to operate. Robert can’t help himself, so Tapsule was right? “Oh I cannot go that far,” says Clarkson who holds on to the one shred of truth that cannot be challenged. “He ignored all the evidence in a most unhelpful and dare I say arrogant manner.” Yup. So Sybil was going to die? asks Robert. For what seems like an eternity, Clarkson looks around the room at the Violet and then Cora who is about to dissolve in tears. “When everything is weighed in the balance I believe that Lady Sybil was going to die,” he says measuredly. Moments after the doctor leaves, Robert and Cora, clinging to each other like life rafts, break down in each other’s arms as Violet turns the other way unable to look at the raw pain exposed once again but finally on its way to healing. 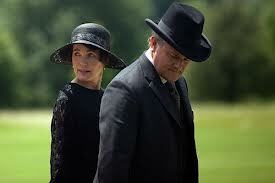 Bates is coming back to Downton! The less said about the prison storyline the better. The Daisy-Ivy-Alfred-Jimmy quadrangle continues to be annoying and from where I sit, unnecessary although I’m sure I’ll be proven wrong. “You’re all in love with the wrong people!” exclaims Mrs. Patmore sick of the all the mooning around. Please, let’s move on from this dribble. The only time shrewish Daisy is interesting is when she visits Mr. Mason who tells her he wants her to come live with him on his farm so that he can teach her how to run it. It turns out he wants to leave her his land, livestock and his money. Daisy tells him she expected to live her life “in service.” Consider this, Mr. Mason tells her, “Do you think these great houses like Downton Abbey are going to go on for the next forty years?” (No, be we are hoping for at least a few more seasons!) I don’t.” “You’re a proper heiress,” says Mrs. Patmore when Daisy (who should split her good fortune with the woman who convinced her to be kind to the man who’d lost his last child) tells her the news. Jimmy is increasingly freaked out by Thomas’s creepy stalking. When the first footman candidate plays the piano in the servant’s hall, Thomas caresses his neck only to be interrupted by O’Brien who can barely hid her glee over the coming implosion. Edith is forging ahead with her plans to become a columnist much to Matthew’s delight and Robert’s disapproval.